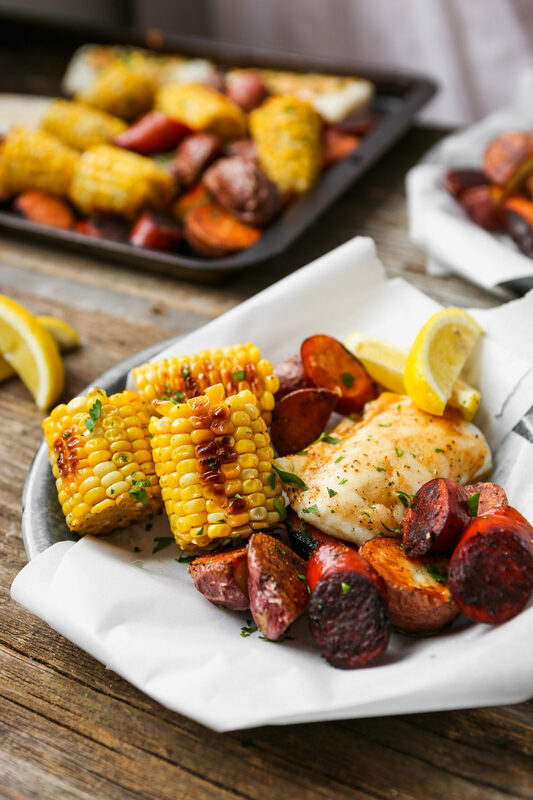 The perfect spring and summer meal, this Roast Halibut with Red Potatoes, Corn, and Andouille is simple, yet packed with flavor. 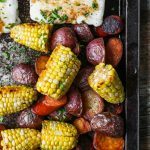 Incredibly easy to whip up, everything for this meal is made on one sheet pan, making prep and clean up a breeze. really teaches you how to roast everything. At first glance, I thought it was primarily filled with meat-focused recipes, but after further inspection, or should I say admiration, I realized how versatile and comprehensive this book proved to be. But really, can you expect anything less from ATK? This Roast Halibut immediately stood out to me, amongst many others that did too, like Roasted Pears with Dried Apricots and Pistachios, Roasted Celery Root with Yogurt and Sesame Seeds, Grill Roasted Whole Trout with Orange and Fennel, and Roasted Mussels, to name a few. 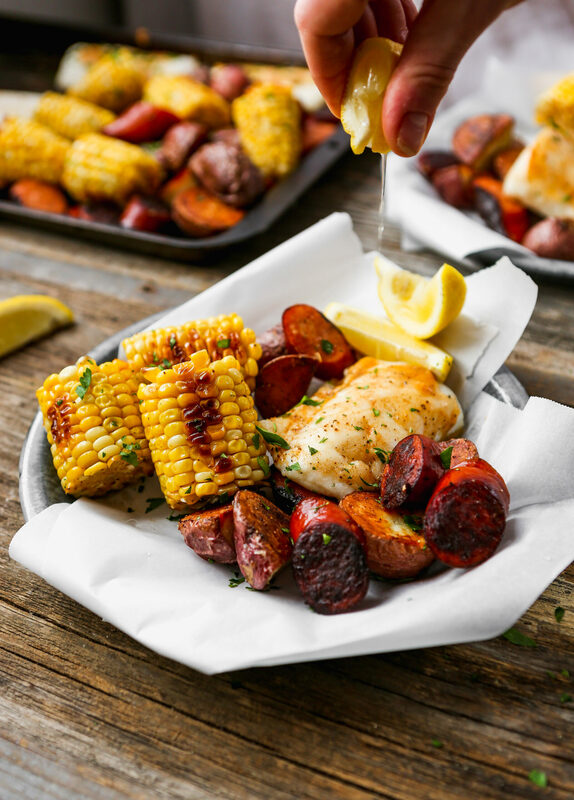 However, I choose this recipe because it felt timely with summer just around the corner (I know, I’m a little overzealous, but I really wanted to share this one with you). Plus, sweet corn is a celebrity in these parts, so it felt like I couldn’t pass this recipe up. 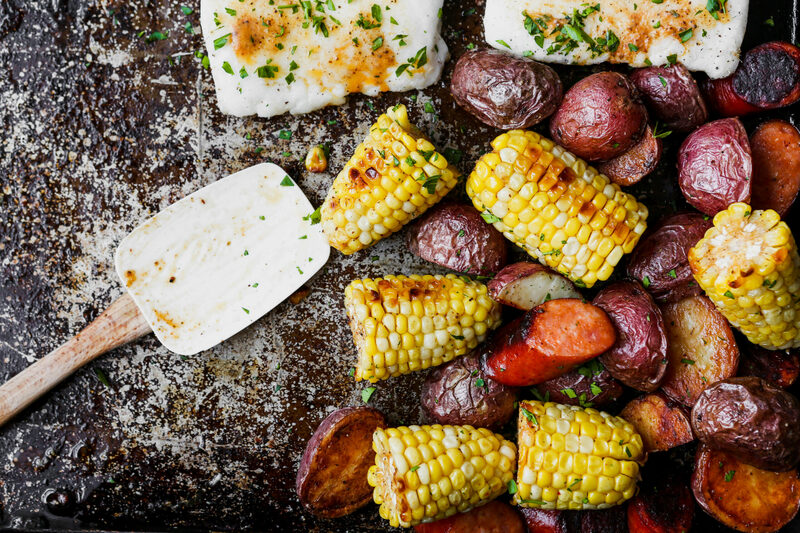 Moreover, I love a recipe that features and celebrates any type of white fish. And roasting is the perfect application for halibut, since it concentrates it’s mild sweetness. 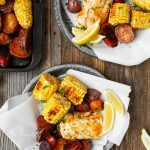 With such a simple ingredient list, it may be hard to believe that this recipe packs much of a flavor punch. But trust me (rather, trust ATK), this meal delivers. Sure, the Old Bay butter does wonders, but it’s all in the roasting, and the method in which they roast the components of this meal. The potatoes, corn, and andouille are roasted first in the bottom of the oven (close to the heating element) at a high temperature, creating the most delicious, deep brown sear (maillard reaction if you want to get technical). Then the oven temperature is decreased before the fish goes in, which allows the fish to still cook quickly, but at an even rate without risk of overcooking. 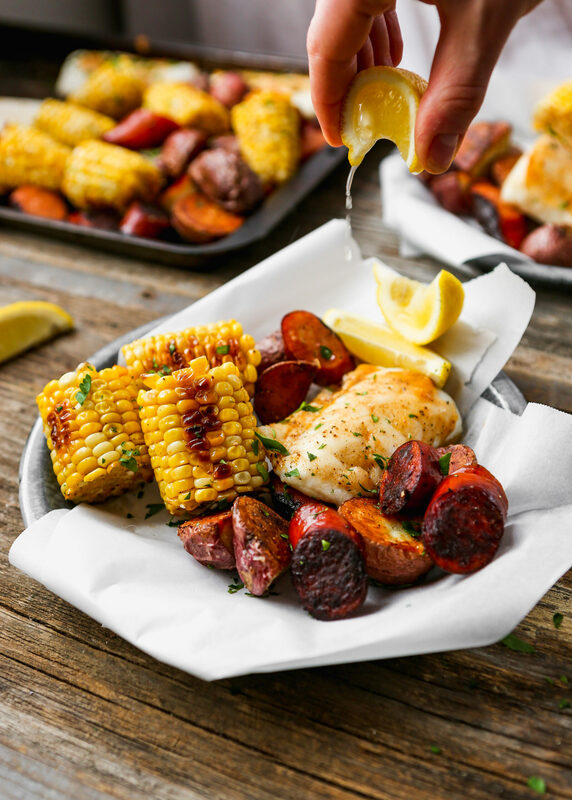 The result, andouille and potatoes that have the most delicious, crisp sear, perfectly cooked and seasoned fish, and plump sweet corn. 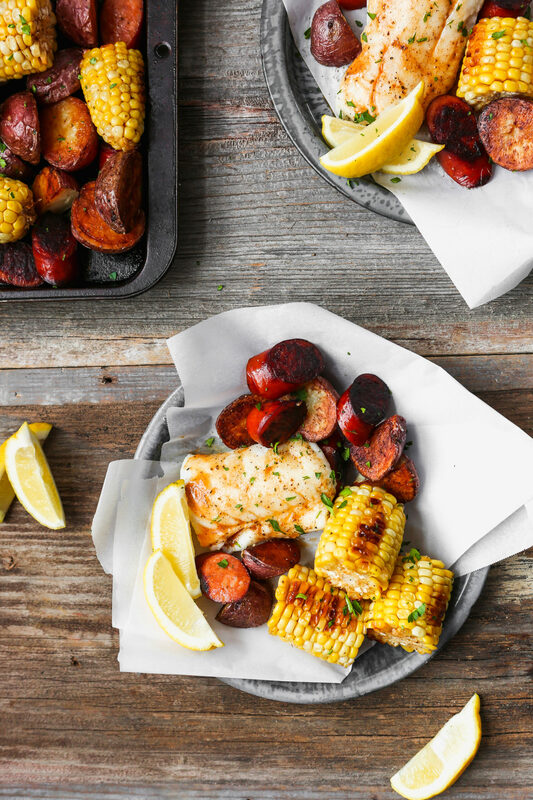 This Lowcountry-inspired meal is one for the books, literally. Adjust oven rack to lowest position and heat oven to 500°F. Mash butter, Old Bay, and lemon juice together in a bowl; set aside. Pat halibut dry with paper towels and season with salt and pepper; refrigerate until needed. Brush rimmed baking sheet with 1 tablespoon oil. Toss potatoes with 2 tablespoons oil, ¼ teaspoon salt, and ¼ teaspoon pepper in a bowl. Arrange potatoes, cut side down, on half of the sheet. Toss corn in now-empty bowl with remaining 1 tablespoon oil, ¼ teaspoon salt, and ¼ teaspoon pepper, then place on empty side of sheet. Nestle andouille onto sheet around corn. 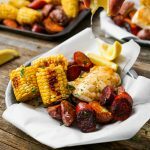 Roast until potatoes and andouille are lightly browned and corn kernels are plump, 20–25 minutes, rotating halfway through roasting. Remove sheet from oven and reduce oven temperature to 425°F. Transfer corn to clean bowl, leaving andouille and potatoes on sheet. Add 2 tablespoons Old Bay butter to corn, toss to coat, and cover bowl tightly with aluminum foil; set aside. Slide andouille to side of sheet with potatoes, then place halibut on now-empty side of sheet. 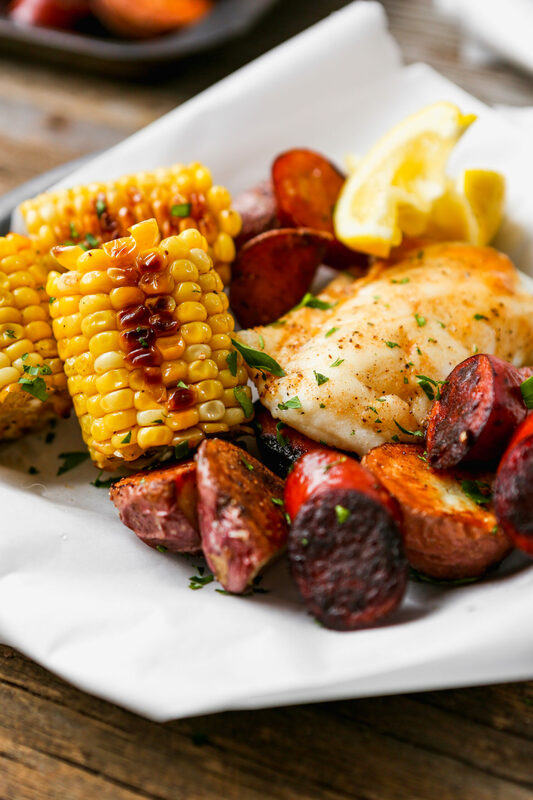 Roast potatoes, andouille, and halibut until fish flakes apart when gently prodded with paring knife and registers 140°F, 8–10 minutes, rotating sheet halfway through roasting. Remove sheet from oven. Transfer potatoes, andouille, and hailbut browned side up to serving dish. Dot remaining Old Bay butter over halibut. Add corn to serving dish, sprinkle with parsley, and serve. 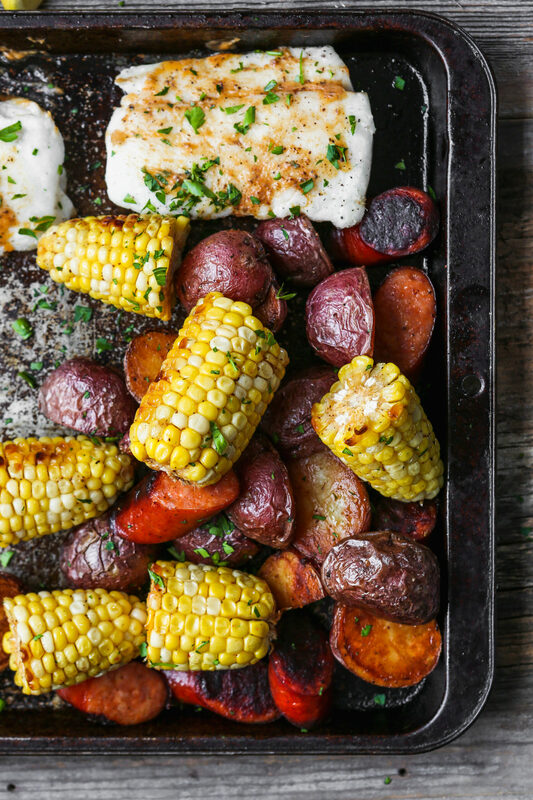 Haddock and cod can be substituted for halibut. , or test your luck and enter to win a copy by following the giveaway guidelines on this Instagram post. The giveaway ends 4/19! Want more from America’s Test Kitchen? Check out these other recipes that have been featured on Zestful Kitchen. I received a copy of How to Roast Everything from America’s Test Kitchen, this recipe is used with their permission. This post contains affiliate links, thank you for supporting all things ZK! Where is the garlic used? It’s in the ingredients but not in the instruciobs. Bert, you are so right! I accidentally wrote garlic and meant to write parsley! So no garlic, just finish with some parsley. So sorry about that!